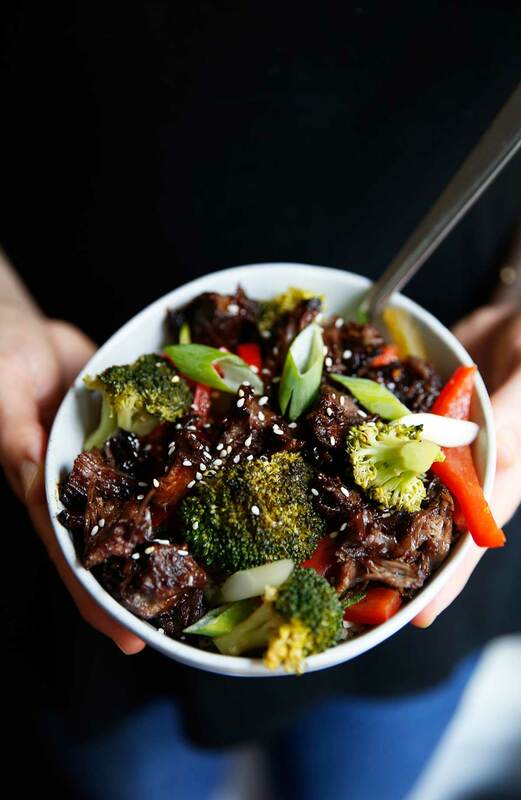 This healthy asian paleo beef recipe, made mostly in the slow cooker, is the perfect make ahead lunch or dinner! It’s paired with cauliflower “rice” and veggies and is a great low-carb, whole30 and paleo meal prep. Double the recipe and you can also make it dinner one night and lunch for the next few days! 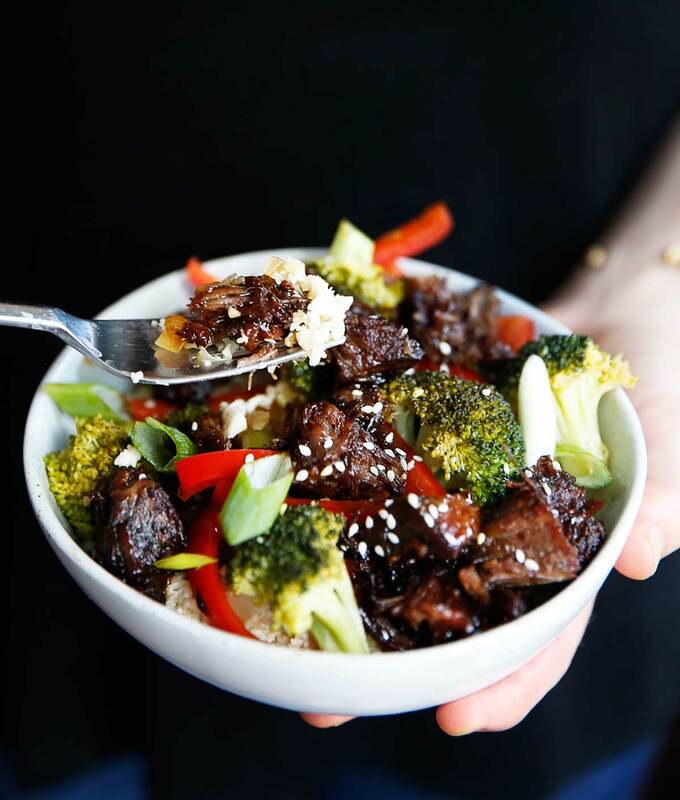 This Whole30, Keto and Paleo Asian Beef and Rice bowl is a great addition to your meal prep rotation! 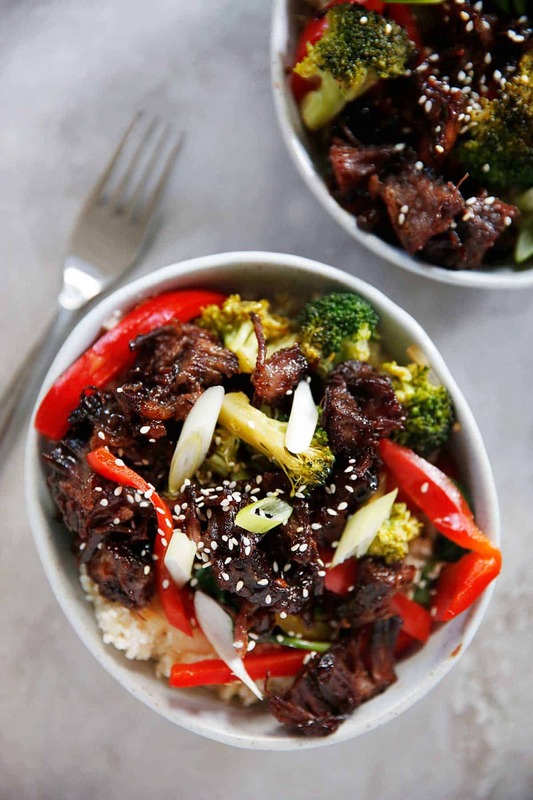 The savory shredded beef is cooked in a slow cooker and then served with veggies, paleo cauliflower rice and a really delicious asian style sauce. 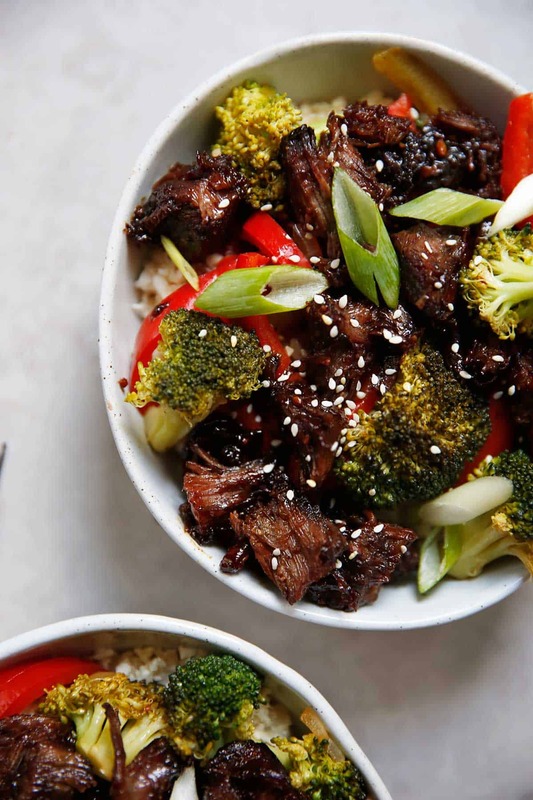 We use onions, red pepper and broccoli but you can really swap out with any veggies you have on hand that you think will go well in this dish like carrots, bok choy, or cauliflower. Can You Use Premade or Frozen Cauliflower Rice? Yes! We take advantage of frozen cauliflower all the time, and love that it’s readily available now. There isn’t much difference between fresh or frozen except that the frozen can hold a little bit more water in it. So if you don’t want to do the extra step of making your own cauliflower rice, feel free to use premade! Season chuck with salt and pepper and in a large skillet, greased, sear on both sides for 30 seconds. Place boneless chuck steak in slow cooker. In a bowl mix together marinade and pour over chuck. Cook on high for 4 hours. Once done, remove from crock-pot and shred, discarding the fat. Pulse cauliflower in food processor until rice-sized pieces form. In a pan heat 1 tablespoon of oil and 1 garlic clove for 30 seconds until flagrant. Add cauliflower rice and mix for 3 to 5 minutes until softened. Remove from heat and set aside. Add 1 tablespoon of oil to pan along with last garlic clove. Add in veggies and sauté for 5-8 minutes until translucent. Add coconut aminos, rice vinegar, red pepper flakes, and salt. Mix and let cook for an additional 5-8 minutes, until soft. Add in shredded beef and let cook together for 5 minutes. Assemble: In a bowl, add cauli rice and then add veggie/beef mixture. Garnish with sesame seeds and scallions. You can mix up any vegetables you have on hand! 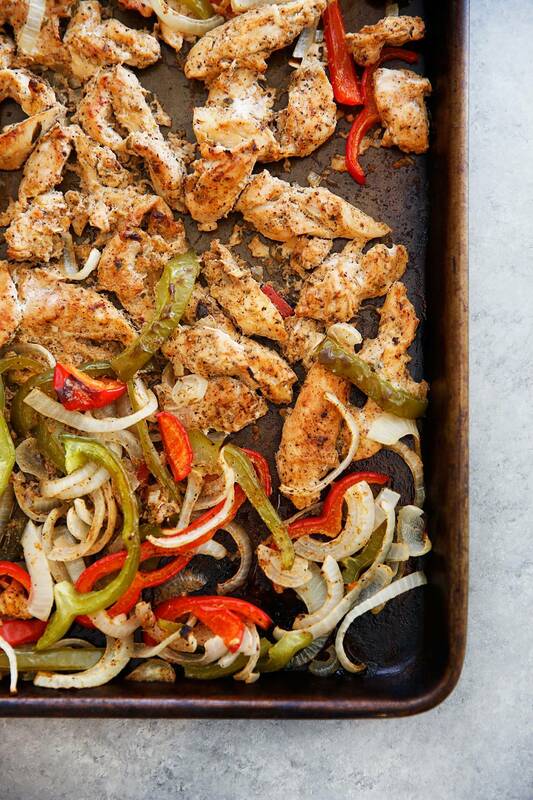 This Sheet Pan Chicken Fajitas recipe is an easy and delicious weeknight dinner that you need to add on rotation right now! 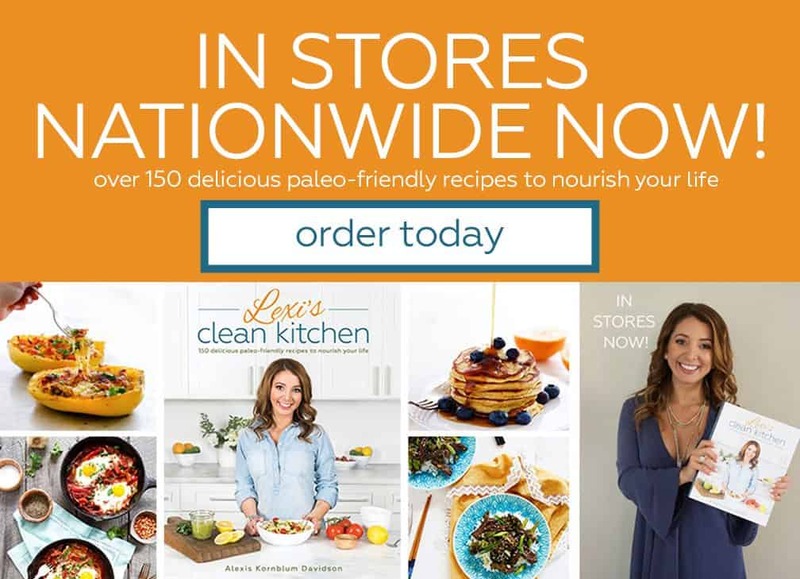 It comes from my girlfriend Gina’s newest cookbook, Skinnytaste One and Done and I am so excited to share it with you today! It’s a no mess, no fuss, easy dinner that everyone will love, plus you can serve it with all of your favorite fixins’! Most of you probably know Gina, but if you don’t, let me tell you — she is seriously one of the most talented, sweet, humble, caring, and genuine people out there. She is also a killer cook, and makes the most GORGEOUS cookbooks. This is her THIRD cookbook, and I am beaming writing this because I am truly so proud of her. It’s just one of those books that needs to be in your collection. It’s stunning, packed with incredible recipes, and absolutely has something for everyone! Skinnytaste One and Done is organized to help you make amazing dishes without all of the mess. It includes everyday cooking equipment such as an Instant Pot®, a sheet pan, a Dutch oven, a skillet, a slow cooker, and an air fryer. This book is so well done (not surprising! ), and I have so many other recipes bookmarked, like the Open Faced French Onion Burgers, Turkey Cheeseburger Soup, Weeknight Chicken Souvlaki, and so many more. 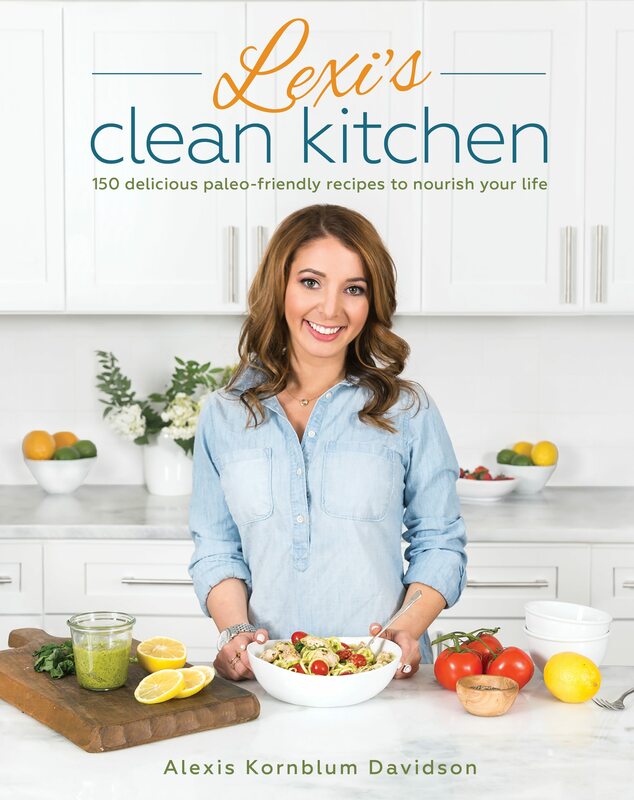 This book has 140 healthy, family-friendly recipes, 120 full-color photos, nutritional information for every recipe, and Gina’s cooking tips! PLUS, even if you don’t own all of the appliances, Gina gives alternative cooking directions using everyday cooking equipment where possible, so you won’t miss out!! She’s just the best. 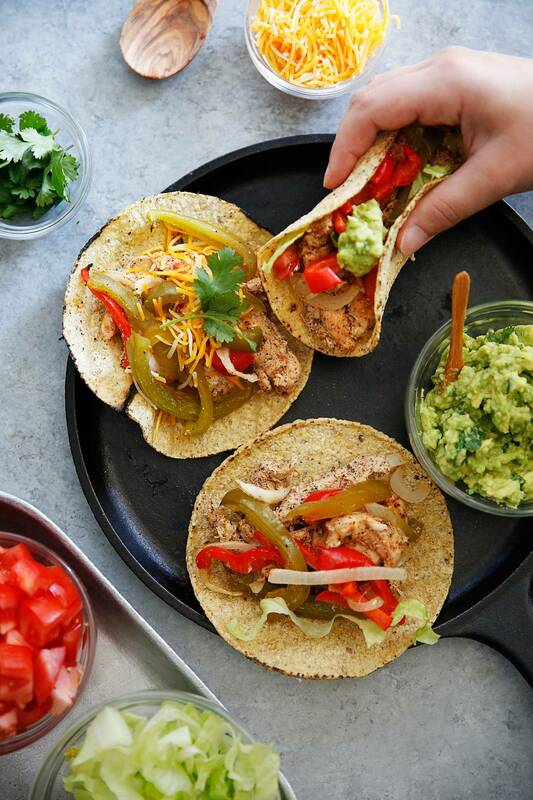 These healthy sheet pan chicken fajitas are marinated to perfection, and come together in under 30 minutes. You will be the star of dinner!!! 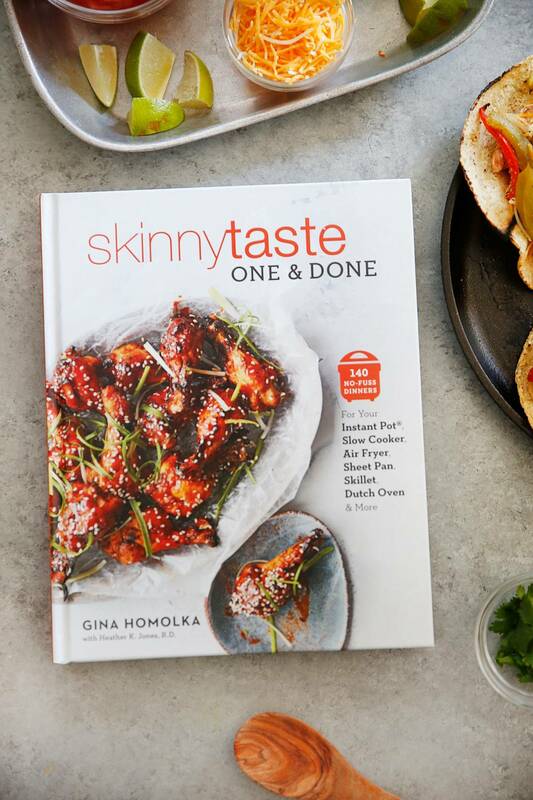 And make sure to grab this amazing cookbook, Skinnytaste One and Done!! Those of you that know Gina, know that she puts her heart into her work and you can absolutely trust that these recipes will be family favorites! Plus, with the holidays approaching, it will make for the PERFECT gift (for yourself and others)!! For the chicken and vegetables: In a liquid measuring cup, whisk together the pineapple juice, lime zest, lime juice, olive oil, onion, garlic, chili powder, cumin, oregano, smoked paprika, and 1⁄2 teaspoon of the salt. Place the chicken in a large bowl and add the marinade, making sure to evenly coat all the pieces. Refrigerate for at least 1 hour or as long as overnight. Adjust an oven rack in the center and another 4 to 6 inches from the broiler and preheat the oven to 400°F. Spray a large rimmed sheet pan with oil and set aside. Remove the chicken from the marinade, shaking off any excess, and place it on the prepared pan. Add the bell peppers and onion to the bowl with excess marinade, and toss well. Spread the vegetables evenly on the pan around the chicken and sprinkle with the remaining 1⁄2 teaspoon salt and pepper to taste. Bake on the center rack until the chicken is almost cooked through, about 15 minutes. Meanwhile, for the guacamole: Mash the avocado in a small bowl with a fork. Add the lime juice, salt, and cilantro, and stir to combine. Set aside. Switch the oven to high broil. Give the vegetables and chicken a good toss, move to the top rack, and broil until the vegetables are slightly charred and the chicken is cooked through, 4 to 5 minutes. Remove the pan from the oven and transfer the chicken to a cutting board. 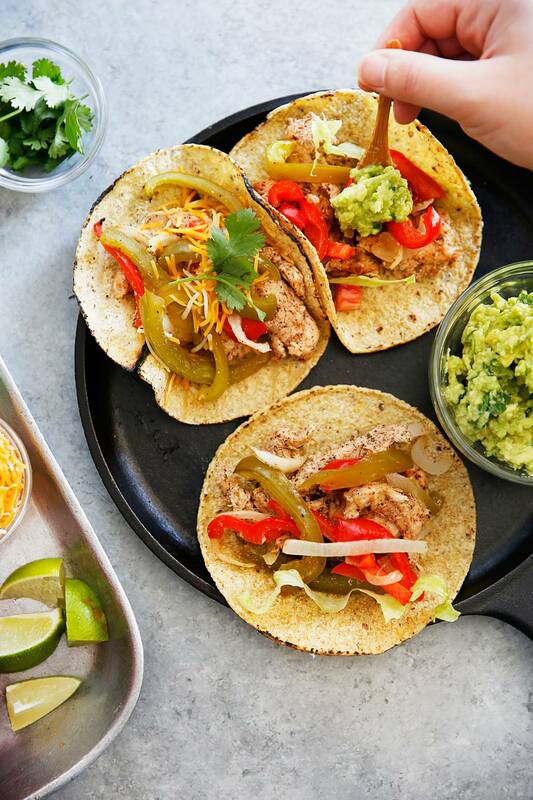 Place the tortillas directly on the top oven rack and broil until warm and slightly charred, about 1 minute, or char on an open flame on the stove top. Slice the chicken into smaller pieces and mix with the vegetables. To assemble, evenly distribute the chicken and vegetables among 8 tortillas. Top with the guacamole and cheese. 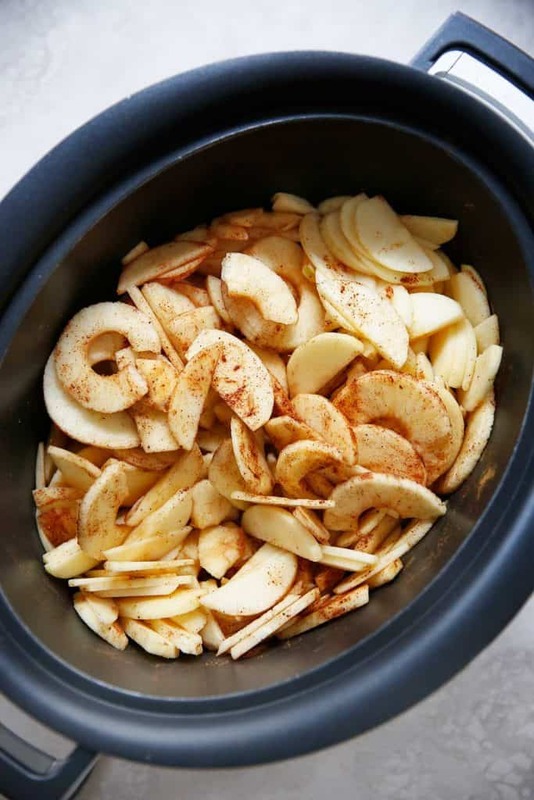 This Slow Cooker Apple Butter has no added sugar and is my all-time favorite Fall spread. 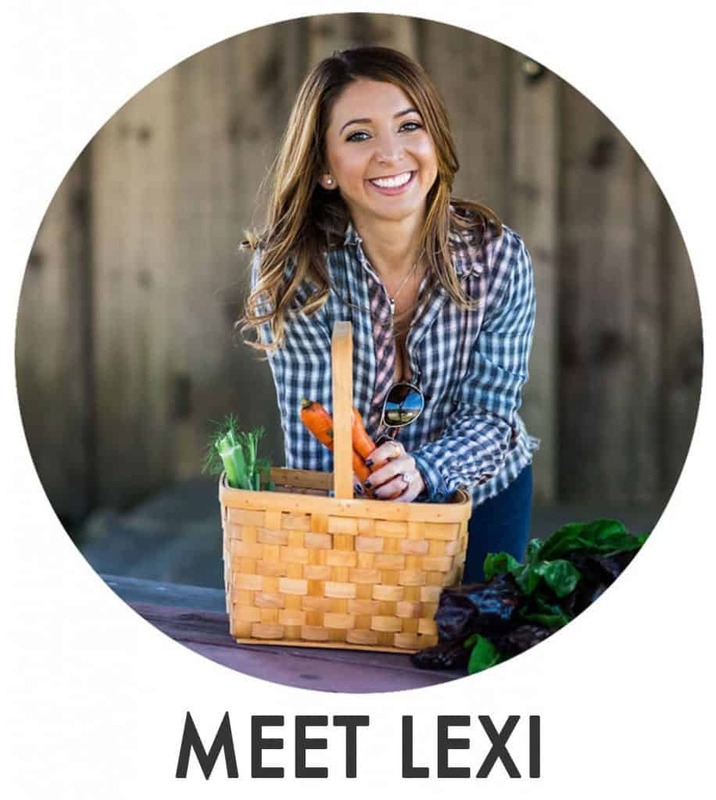 It’s Whole30 compliant, paleo-friendly, and is so delicious! It’s filled with in-season fresh apples and fall spices that will make you’re home smell heavenly. 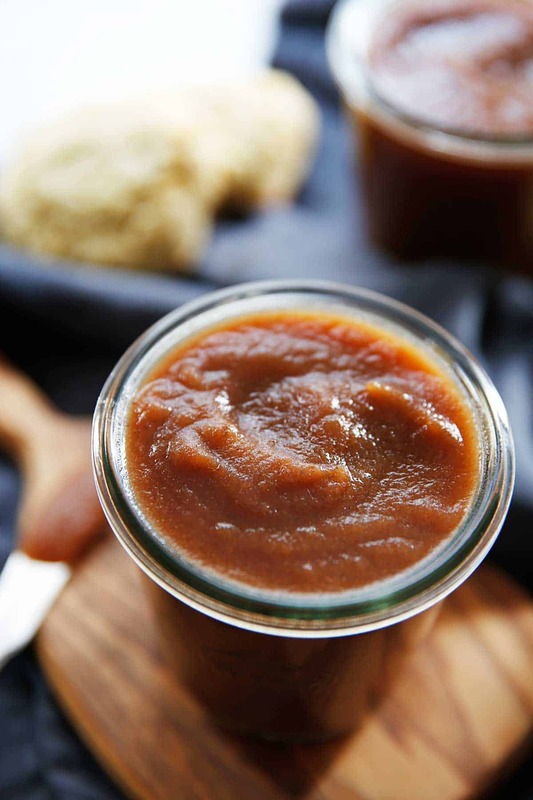 While studying for my undergraduate degree at the University of Massachusetts Amherst I found a serious love for apple butter thanks to frequent visits to Judie’s Restaurant. Back before I changed my diet I would enjoy the giant popovers they served slathered with the most delicious apple butter. It has been a while since I’ve been there, but I haven’t forgotten that apple butter and realized it was time to create a recipe of my own that wasn’t loaded with refined sugar. 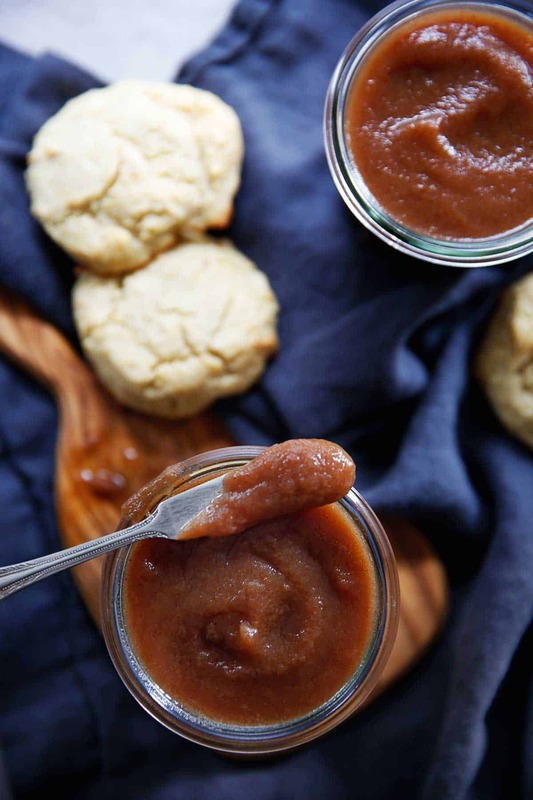 While I won’t be enjoying this apple butter on top of popovers anymore, rest assured there are plenty of ways to enjoy it, with this, on top of these, over these or with the biscuits in my book. But really, it’s amazing just by the spoonful. There are loads of other apple butter recipes out there, some with long cooking time and some with short. I really feel like the longer and slower the cook, the more depth of flavor the apple butter has, so a 2-hour version just has never cut it for me. But aside from the prep and the finishing touches, this recipe is relatively hands-off and can even be done overnight. How Do You Know When Apple Butter is Done? 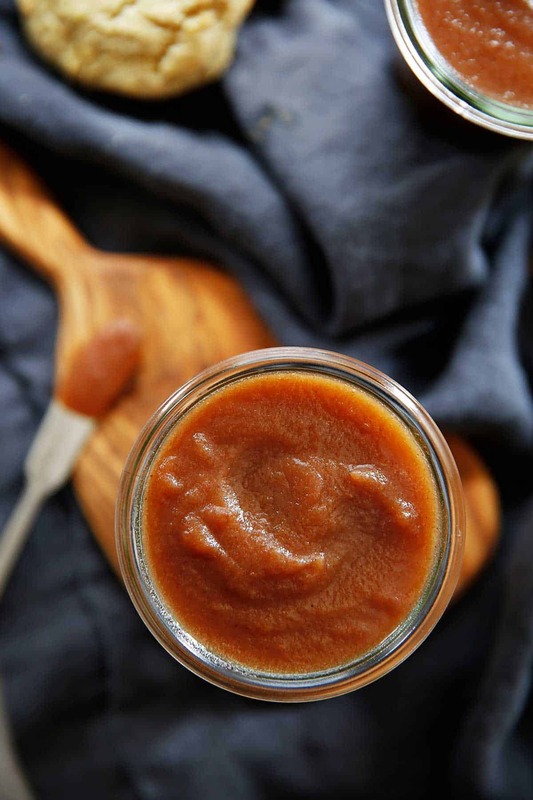 You want the apple butter to be dark in color and quite thick, thick enough that when you pick it up by the spoonful it mounds on the spoon instead of dripping off. Put everything in slow cooker. The cider or juice should not overpower apples. Cook on low for 10-12 hours. At 10 hours, once apples are dark, immerse hand blender or transfer to a high speed blender and blend until smooth. Put lid back on slightly ajar and let cook for the remaining 2 hours. If you're in a time crunch, place into a pot on the stove over medium-low heat and let simmer until thick. Let cool, store in jars in the fridge for up to 1 week unless canning. -Very thick and spreadable. Perfect top spread on toast, or to top your favorite oatmeal, pancakes, or waffles! Heat water in a large, deep saucepot equipped with a lid. If you have a canning rack or a cooling cake rack, place the rack at the bottom of your saucepan. Bring the water to a simmer (not a boil) and carefully submerge your jars along with their lids for about 5 minutes or until warm. Make sure water is inside your jars to keep them submerged. Carefully remove the jars and lids from the warm water with tongs and place on a cooling rack set over a kitchen towel. Pour the apple butter into each jar using a funnel, leaving at least 1/4 inch of space at the top. Make sure there are no air bubbles in the jam and that the rim of the jar is clean before securing the lid. Cover your saucepan and bring the water to a boil over medium-high heat. Submerge the tightly closed jars in the boiling water for 10 minutes. Take your saucepan off the heat and allow your jars to sit in the hot water for another 5 minutes. Carefully take your jars out of the hot water and place on a paper towel. Check jar lids for seals by making sure the lids do not flex up and down when pressing the middle of the jar. Store in a cool, dark place for up to one year! Once opened make sure to store in the refrigerator for up to one week! 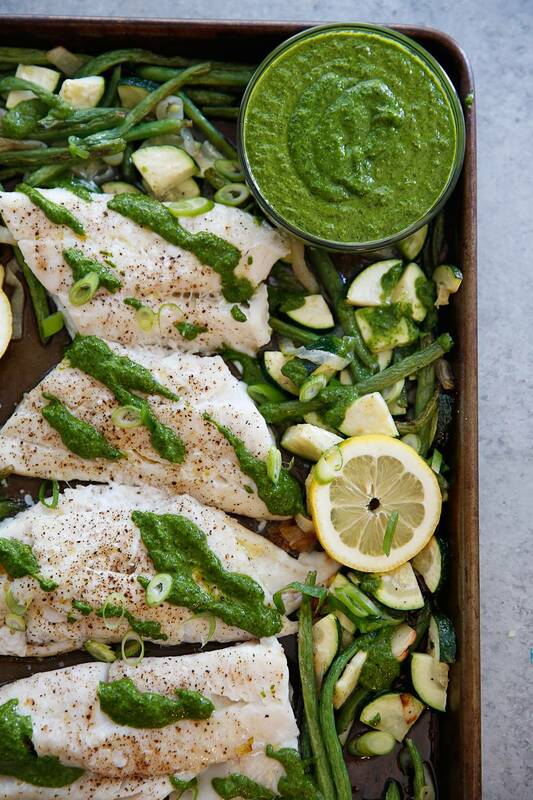 This Sheet Pan Cod with Vegetables in Lemon Herb Sauce is the ultimate Spring or Summer meal with perfectly cooked lemon herb cod, tender veggies, and a delicious green sauce. 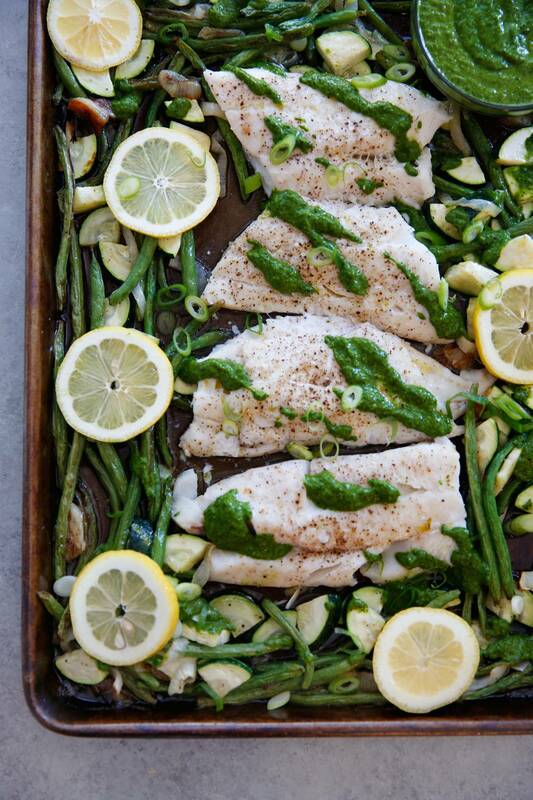 It’s the ultimate sheet pan fish dish everyone will love! This sheet pan fish dish is a light and quick weeknight dinner you can get on the dinner from start to finish in just over a half an hour with minimal clean up! Sheet pan dinners are the best because they minimize clean up by utilizing one cooking vessel and they make cooking hands off. This sheet pan dinner is low carb for a nice light meal that is still going to leave you satisfied because it is packed with flavor and loaded with fresh, in-season vegetables. 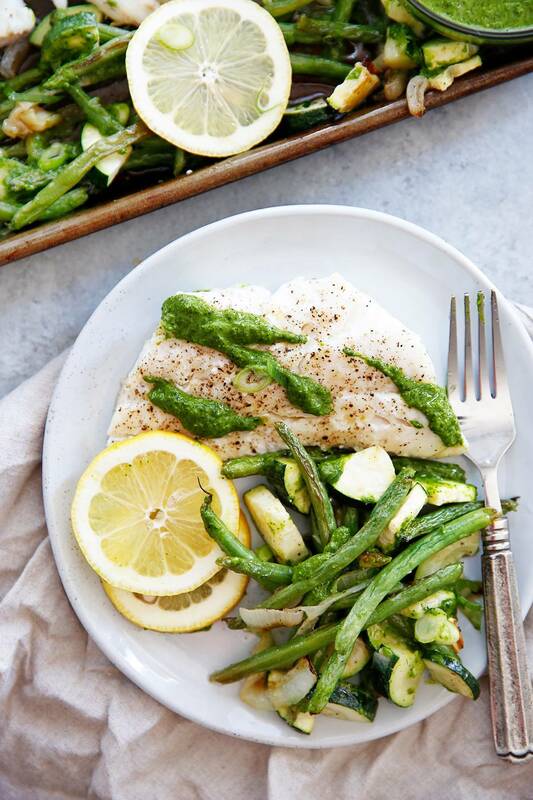 The green herb sauce is made of few different herbs and aromatics with a punch of acidity thanks to the lemon that makes this dish really stand out! Read the recipe all the way through (of course) and plan to use a timer! Most recipes require different cooking times, so make sure to use a timer so you can truly walk away from the oven and not have to worry about when your adding anything in to the oven. Do the prep ahead of time: Cut vegetables, make sauce or mix spices the night before or that morning if you are looking to speed up the process when it comes time for the actual cooking. Use parchment paper to make clean up a breeze. Use the correct size sheet pan. 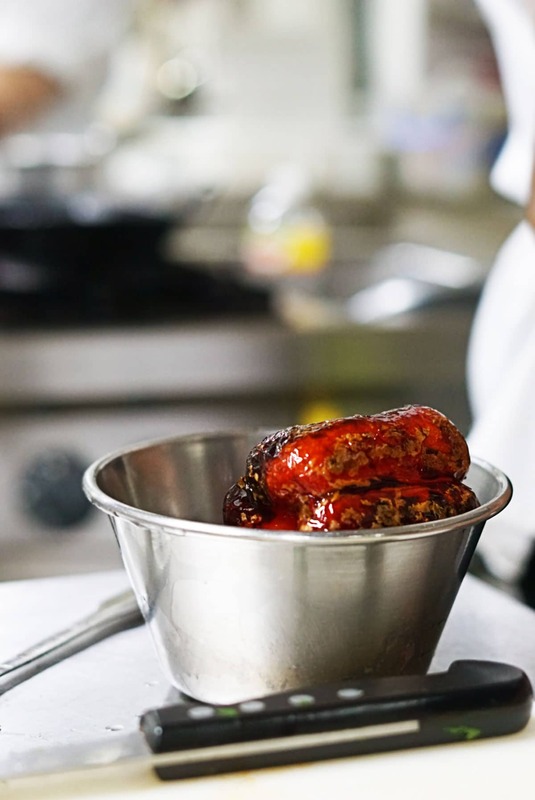 When we say sheet pan we are referring to the rimmed half sheet pan which is 18″ by 13″. The size of the sheet pan matters because you do not want to overcrowd the pan when cooking, so if you are using a smaller sheet pan you may need to use 2 to achieve the same result. I love using cod over Tilapia since cod is almost always farm-raised. Farm-raised fish have been found to have high concentrations of antibiotics and pesticides so I try to avoid them and buy wild fish that I can trust! 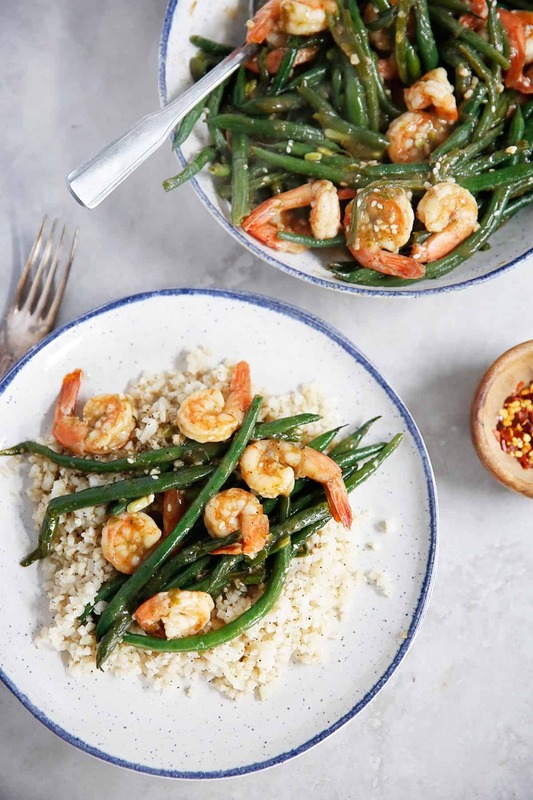 On a rimmed baking sheet combine green beans, onion, 6 garlic cloves, 2 teaspoons avocado oil, 1 teaspoon fine sea salt and 1/2 teaspoon ground black pepper. Bake in oven for 10 minutes. Meanwhile make lemon in herb sauce: In a blender combine 2 cloves garlic, parsley, cilantro, dill, scallion, lemon zest, lemon juice, 1/4 teaspoon salt and 1/4 teaspoon black pepper and blend until combined. Set aside. 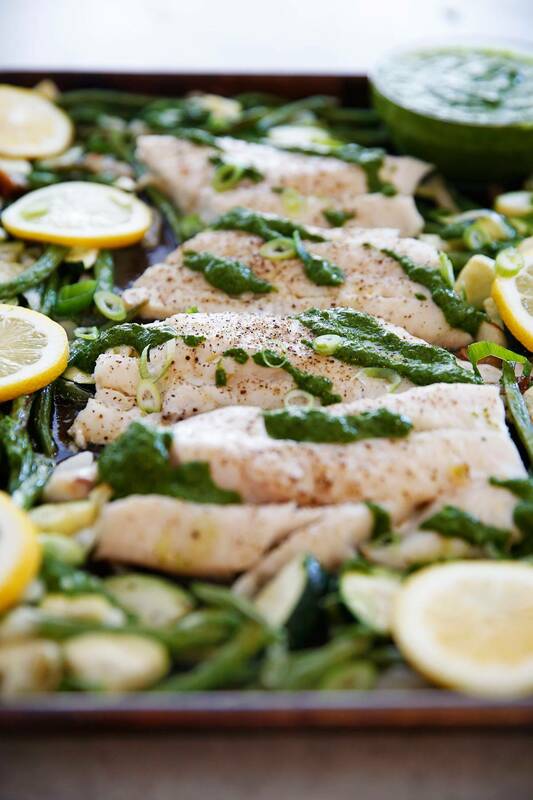 Drizzle cooked fish and vegetables with lemon herb sauce and garnish with lemon slices! You can tell a fish is cooked through by sticking a thin knife in the center. The fish is fully cooked when there is no resistance when inserting the knife or the fish reaches a temperature of 145ºF in the center. 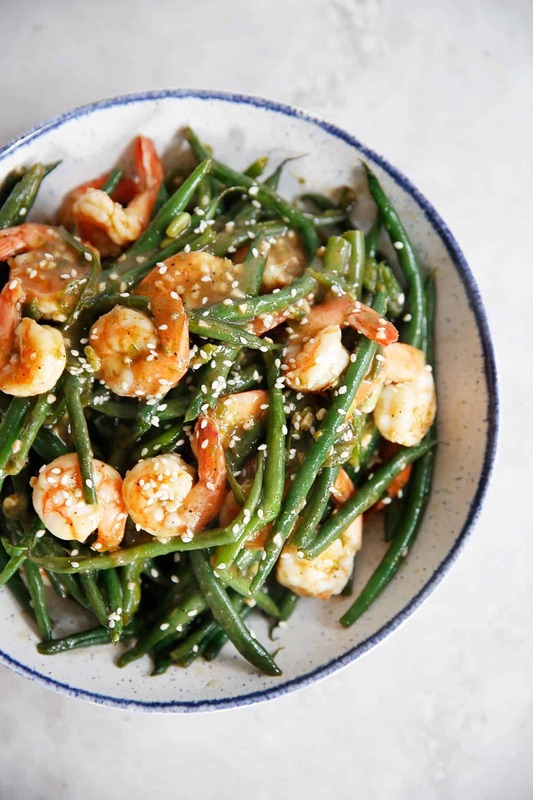 This One-Pan Shrimp and Green Beans recipe in Chinese Garlic Sauce is the perfect, easy, whole30 compliant weeknight meal made in under 30 minutes! I love healthy versions of my favorite Chinese food recipes! Growing up, we often ordered Chinese food, and while I have a clear memory of how delicious it was, it’s obvious now how unhealthy those dishes can be. This garlic sauce is thick and flavorful, and reminds me so much of a yummy oyster sauce I used to order as a kid! I love serving this dish over cauliflower rice, but white rice would be delicious too! Heat 2 teaspoons oil in a large skillet over medium heat. Add green beans and season with salt and peppers. Sauté for 2-3 minutes until beginning to soften. Reduce heat and carefully pour 1/4 cup water in hot skillet (it will sputter, so be careful of steam) and cover pan with a tight fitting lid to steam for 10 minutes. Monitor carefully to make sure the water does not completely evaporate before the beans have steamed, adding more if necessary so they do not burn. Meanwhile, in a small bowl whisk together coconut aminos, rice vinegar, garlic, ginger, sesame oil and sriracha and set aside. In a separate small bowl whisk arrowroot and 4 teaspoon water to make a slurry to thicken the sauce. Set aside. 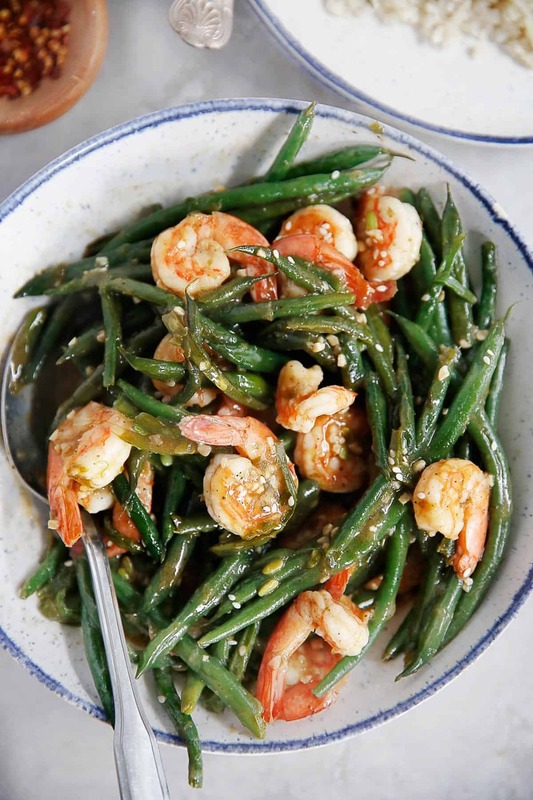 Once beans have steamed, uncover and add shrimp and toss. Add in coconut aminos sauce ingredients, mixing to ensure it cooks evenly. 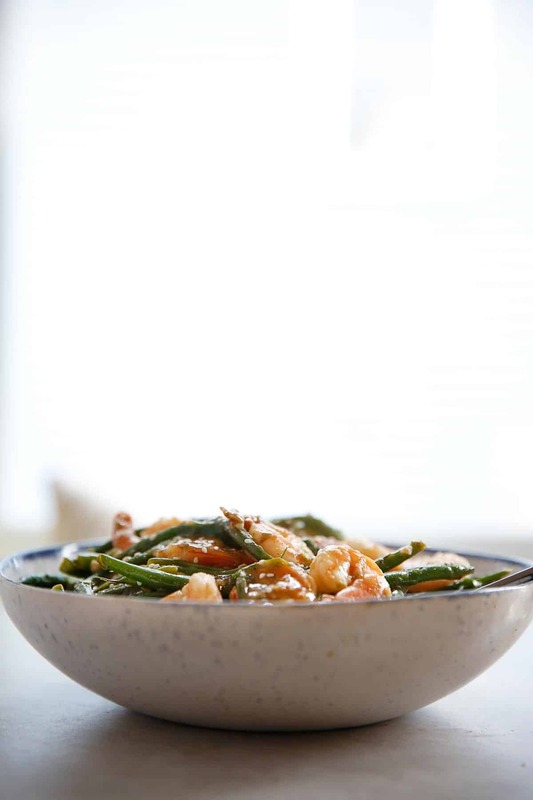 When shrimp has cooked through, add in slurry and bring to a simmer to thicken. Once thickened, immediately remove from heat. Serve hot and serve over cauliflower rice or white rice. 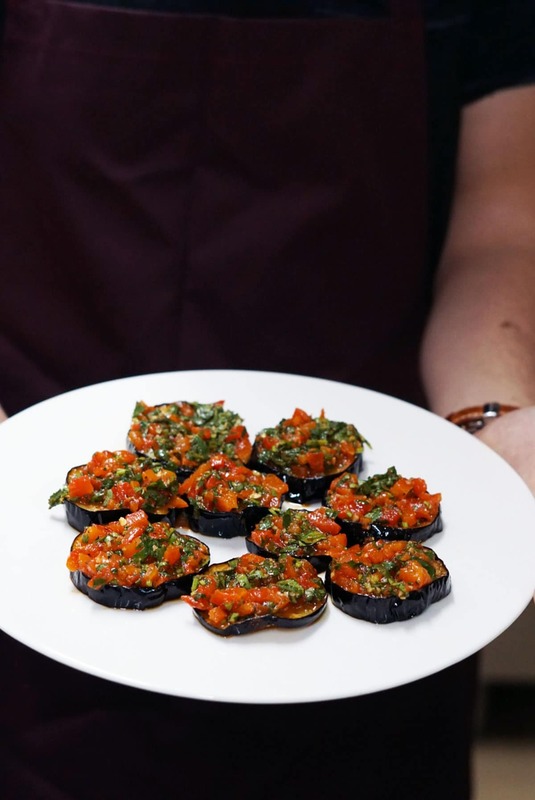 When we were in Morocco and took a cooking class at Riad Fes, we made this Moroccan Eggplant (with Chermoula) appetizer that blew our minds! This Moroccan eggplant recipe is easy to make, has so much flavor, and is SO SO delicious. The perfect Moroccan starter! Plus, the chermoula with roasted peppers would be fabulous on fish, meat, or chicken, too! If you read my Morocco recap, you know we had the most magical trip. We loved the culture, the people, and of course, the food. When the amazing chef from Riad Fes said I could share a few recipes from our cooking class with you, I was SO excited. We had a blast in the kitchen cooking up all sorts of traditional Moroccan dishes and I am so excited to share some of them with you! This is Mike holding the plate of our Moroccan Eggplant sliders that we made during the class! 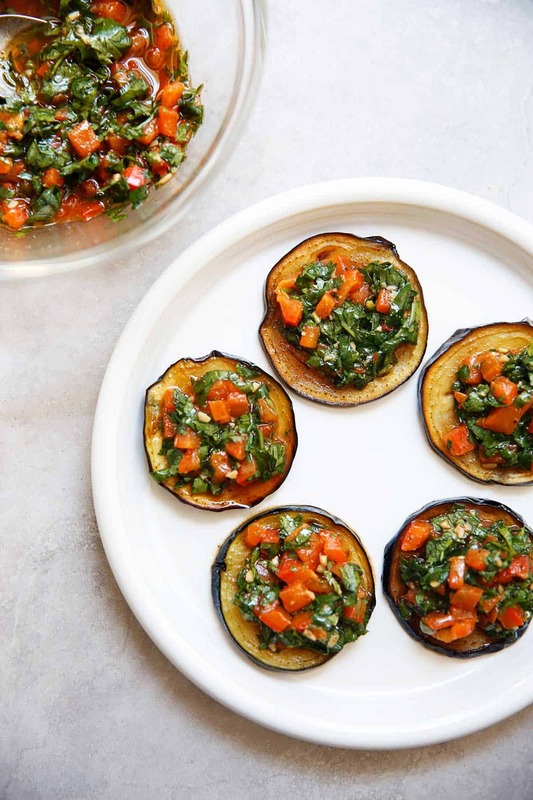 This roasted red bell pepper is the perfect addition to this delicious chermoula. 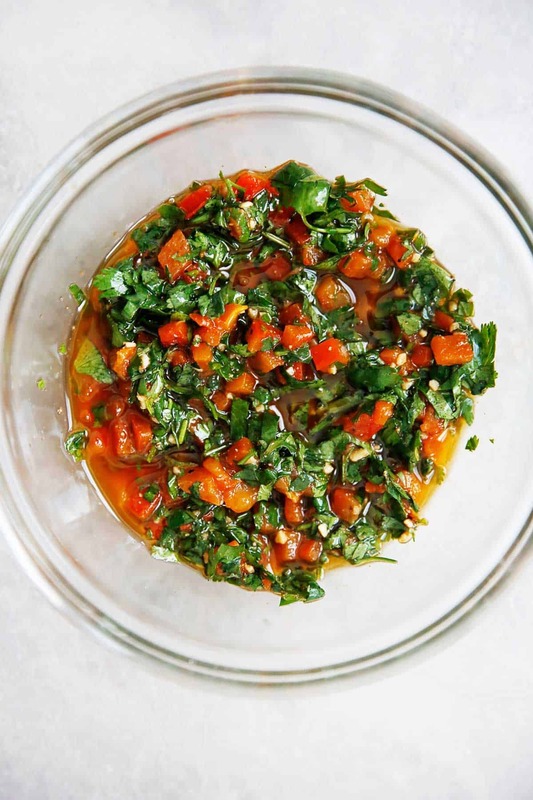 This chermoula is made with fresh herbs, good quality olive oil, roasted red bell pepper, and all the fresh Moroccan flavors we have come to love and cherish since our trip. I love this sauce on top of chicken, meat, and fish. It’s simply perfect, and easy to prepare! Enjoy!! Cut the eggplant into slices. Add a little salt to disgorge. Fry the eggplant slices in hot oil until both sides are golden. Put the red pepper in the oven for ten minutes. Place in a bowl and cover with plastic wrap and let steam for a few minutes. Peel the pepper to keep only the flesh. Chop finely the pepper. In a bowl, grate the garlic, chop the parsley and coriander very finely, add the olive oil, lemon juice and spices, chopped peppers and marinate. Spread the marinade on a face of each slice of eggplant. Serve!